My new occupation, public health wizard, if the high court declares health reform unconstitutional? So, less than 24 hours before the momentous decision of the conservative leaning U.S. Supreme Court on the constitutionality of the Patient Protection and Affordability Care Act (ACA), I am hearing almost no public discussion or reading any popular media addressing moral issues. If the Supreme Court strikes down health care reform, should public health practitioners go to Hogwarts to learn magic, so they can solve public health problems with wands and spells and not actual resources, namely money? Instead, we are hearing legal scholars discuss what time of the morning the justices come into the chamber, or whether the so-called individual mandate, which would compel every American to buy health insurance in the private market, is permissible under the Commerce Clause doctrine. We are getting detailed accounts of the ways the court might go on key issues, such as Medicaid’s expansion to have the federal government expand coverage to persons 133% above the federal poverty level and if the lawsuit by 26 states attorney Generals is valid before the law can be implemented. And so on and so forth, go very learned people trying to make sense of a complicated case. What we are not hearing enough of are discussions about how many millions of Americans remain uninsured, and the costs associated with doing nothing to address that crisis. (The U.S. Census Bureau pegs the number at 50 million.) We are hearing next to nothing about the historic efforts that have prevented this nation from adopting a national health care system like other modern, capitalist democracies such as Canada, Taiwan, Japan, and France (see this comparison of how the United States system is different than and similar to other national systems, but still less efficient and more expensive). I suppose we are not getting this rehash because our nation already had that spasm of coverage during the debate before the passage of the ACA in Congress along strictly party lines in March 2010. So in this vortex of news distortion without perspective, I would recommend that anyone who wants to get a grasp of the “bigger story” about the essential inequity and deficiencies in the U.S. health system read T.R. Reid’s clearly written tome called The Healing of America, the book I read before I began my studies in public health in 2010. In his 2009 analysis of health care systems in France, Germany, Japan, the UK, Canada, India, Switzerland, and Taiwan, Reid finds we are doing far worse in the United States, paying more money, and living less healthy lives, despite the false propaganda that we have the “best health care system in the world.” You can see a summary of the other national models here. I am not the first person to point out that learned persons, such as the 12 justices who will rule on June 28, 2012, should read this book. So again we are failing to discuss the main issue here, which is a moral one. Health care, argue many medical and religious leaders, is not purely a political issue, but a moral right. I will leave this post with a very clearly stated summary from the group called Physicians for a National Health Program, an 18,000-member organization dedicated to the creation of a national single-payer health program. The organization states: “The U.S. spends twice as much as other industrialized nations on health care, $8,160 per capita. Yet our system performs poorly in comparison and still leaves 50 million without health coverage and millions more inadequately covered. This is because private insurance bureaucracy and paperwork consume one-third (31 percent) of every health care dollar. Streamlining payment through a single nonprofit payer would save more than $400 billion per year, enough to provide comprehensive, high-quality coverage for all Americans.” I could not have said it better myself. As for me, I was contemplating a bit of street theater downtown on June 28, but perhaps in my laziness I did not execute the costume and plan. Maybe later, when we learn about the implications of the Supreme Court’s decision, I will dress up as a public health wizard, like Harry Potter and his pals at Hogwarts. 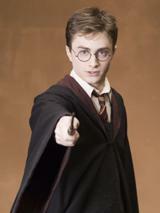 Then, I will recite magic phrases and wave my wand and cast spells to cure people and pay their medical bills, without of course actually doing something to fix what is ailing our political and health care systems that continue to leave our nation dragging behind other countries by all measures. That may actually be a job in demand, because if the ACA is struck down, a lot of public health interventions will no longer be funded, and our nation’s health will be worse because of it. 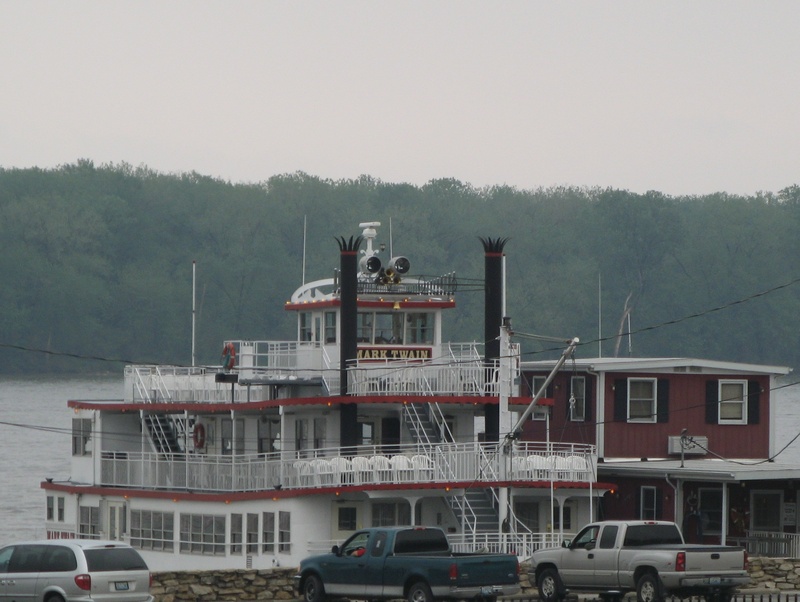 The Mark Twain riverboat in Twain’s hometown of Hannibal, Mo. But as I have said, a day came when I began to cease from noting the glories and the charms which the moon and the sun and the twilight wrought upon the river’s face; another day came when I ceased altogether to note them … . No, the romance and the beauty were all gone from the river. All the value any feature of it had for me now was the amount of usefulness it could furnish toward compassing the safe piloting of a steamboat. Since those days, I have pitied doctors from my heart. What does the lovely flush in a beauty’s cheek mean to a doctor but a ‘break’ that ripples above some deadly disease. Are not all her visible charms sown thick with what are to him the signs and symbols of hidden decay? Does he ever see her beauty at all, or doesn’t he simply view her professionally, and comment upon her unwholesome condition all to himself? And doesn’t he sometimes wonder whether he has gained most or lost most by learning his trade? And it is with these words, etched in my head, that I began to realize that I had become a zombie. To be precise, I had become a fully credentialed (MPH) public health zombie. When I attend big festival type events, I no longer experience pure fun and enjoy the carnival atmosphere in a pure form. I look at how healthy or, rather, how unhealthy the food sold is. Is it loaded with transfat and sodium? Is it industrially raised meat with potential risks of carrying e-coli? 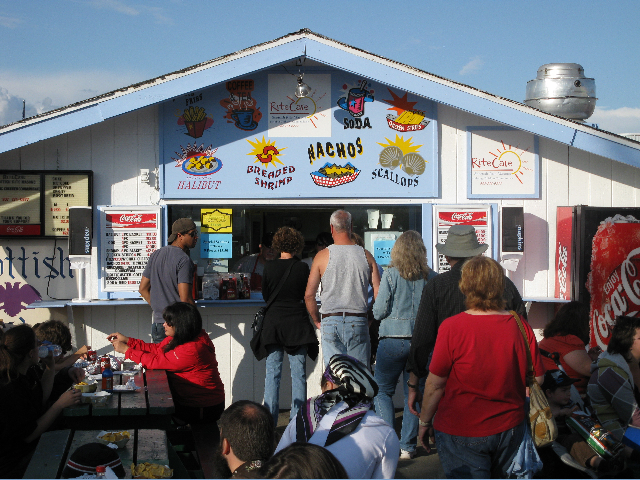 Fairgoers at the 2009 Alaska State Fair in Palmer, Ak., load up on deep fried everything. Did people drive to this event, or did they use a healthy form of active transportation like biking, walking, or perhaps a bus? 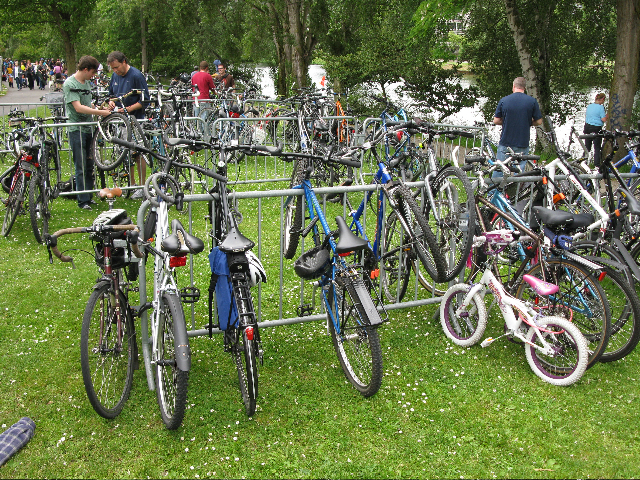 Bikes aplenty were found at the Fremont Fair on June 16, 2012, in Seattle. And what about that “electric” cigarette stand run by “Vapor Pro”– a definite concern of public health officials trying to battle the peddlers of nicotine to young and old people alike. 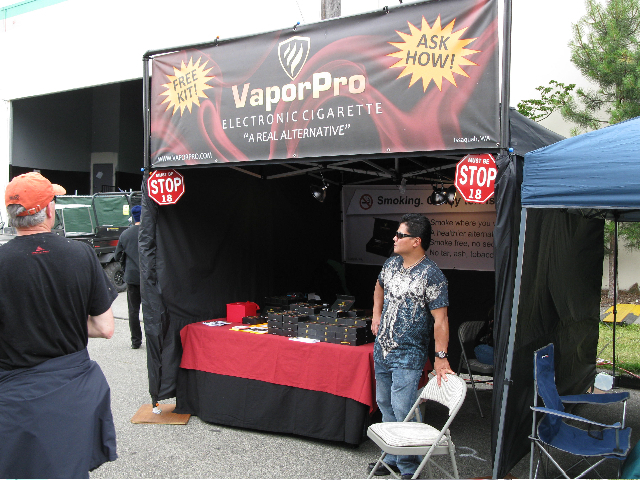 Electric smokes were being sold at the Fremont Fair on June 16, 2012 — should they be allowed? I also recently visited a middle school in Snohomish County, and was looking at the school entirely as an environment where public health interventions were or were not working. Were kids walking and biking to school? No, they had to bus. The school was located off a busy highway, and there were no sidewalks anywhere near the school. I could go on and on and on. The visit actually was driving me nuts because of all the built environment issues I was seeing that was preventing the kids from being more active than they could be. For its part, the CDC has, to my delight, decided to poke fun at its earnest seriousness protecting the public’s health by launching a “zombie preparedness” campaign to prepare for a “zombie apocalypse.” The was a surprisingly successful tongue-in-cheek awareness campaign on how to prepare for disasters. It received a lot of coverage. Was this a sudden dash of entrepreneurial social media savvy by the organization dedicated to protecting the health of the nation that tens of millions of Americans know little or next to nothing about? As much as I hate seeing people eat incredibly unhealthy food, and smoke cigarettes in any form, and get drunk on beers in the midday sun, and drive their cars everywhere, I wish I could now just turn off my own “public health zombie.” Now I often ponder if I have succumbed to Twain’s curse of the riverboat pilot, contemplating what I have gained against what I have lost by learning this trade. The good news is, I have my next Halloween costume already planned: a zombie public health inspector. I think few could argue with the humanitarian goals of this type of health intervention, at least with some basic metrics. But in reality, health-related assistance usually has a broader function. 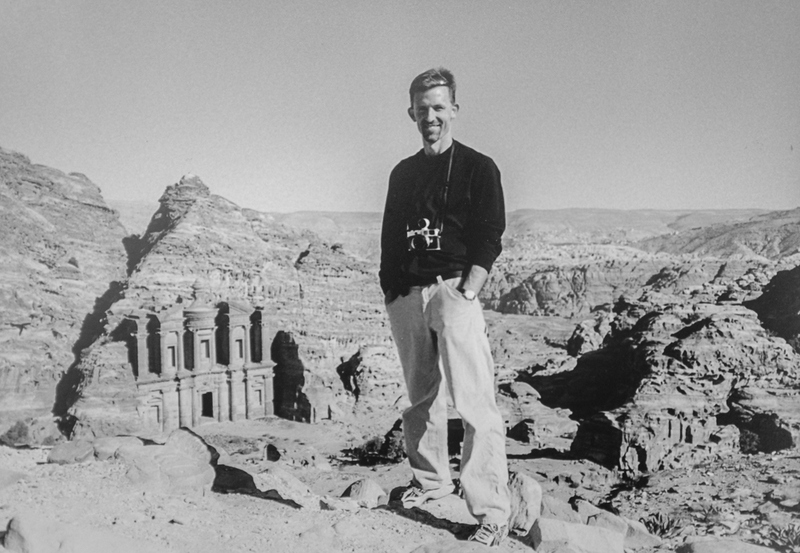 Combining “hard” and “soft” power is nothing new to geopolitics or the U.S. Government and its diplomatic, development, and military branches. The two often go hand in hand. Closer to home for most Americans, but still far away in the U.S. Arctic in communities along coastal Alaska, the U.S. Coast Guard has spent four years expanding its training activities and capacities in the Arctic to prepare for offshore oil drilling by Shell Oil Co. Production is scheduled to begin in the summer of 2012 in the U.S. portions of the Beaufort Sea, just north of one of America’s largest oilfield, Prudhoe Bay. Oil would then be shipped down the aging and half-empty Trans-Alaska Pipeline System (TAPS). 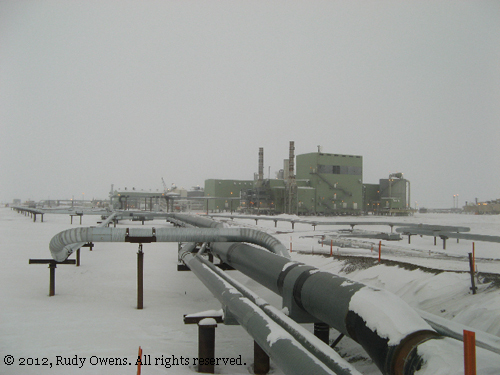 The Prudhoe Bay oildfield is one of United States richest oil producing areas, but its production is declining leading to offshore development. 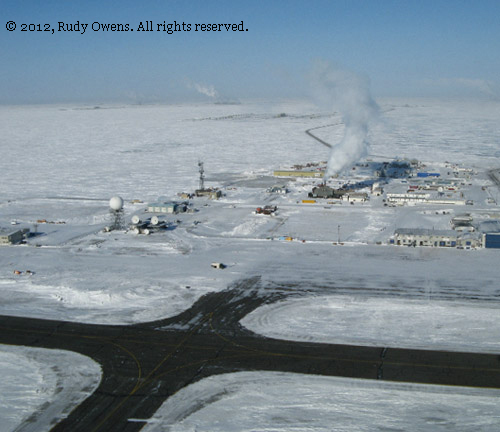 Deadhorse is the main landing area for the North Slope oil and gas production facilities in Alaska. 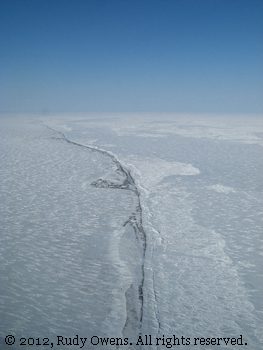 The coast of the Beaufort Sea holds significant oil reserves that Shell Oil Co. will begin tapping in the summer of 2012. All told, Shell spent some $2.2 billion for offshore leases alone, not to mention millions in legal wrangling, government relations, PR, advocacy in Alaska and in DC, and much more since the mid-2000s. The New York Times estimates Shell spent $4 billion in its quest for one of the biggest oil prizes in North America outside of the Athabascan oil sands of Alberta and shale oil finds in North Dakota. (Shell also is drilling for natural gas in the Chukchi Sea this summer also.) The issues framing a stronger U.S. commitment in the Arctic are natural gas and oil resources and a so-called “race for resources,” as it has been described by some, which concerns rights to those resources on the Arctic Ocean seabed floor. The U.S. Energy Information Agency claims that nearly a quarter of untapped oil and natural gas resources are in the Arctic basin, which explains the significant interest by the major multinational oil exploration companies in the shallow Arctic waters off Alaska’s North Slope. Companies like Shell and ConocoPhillips and others have been staking out their claims for years by buying controversial offshore drilling leases that have been sharply contested in protracted legal fights with environmental groups and Native Alaskan residents of the North Slope Borough (the Inupiat). The Inupiat residents, who, while mostly supporting onshore development, are concerned about the threat an oil spill or blowout in pristine Arctic waters, similar to BP’s spill in the Gulf of Mexico in 2010. Some Inupiat resident say that would harm their subsistence hunting of migratory bowhead whales, which have been hunted and eaten by these historic Arctic residents for thousands of years. 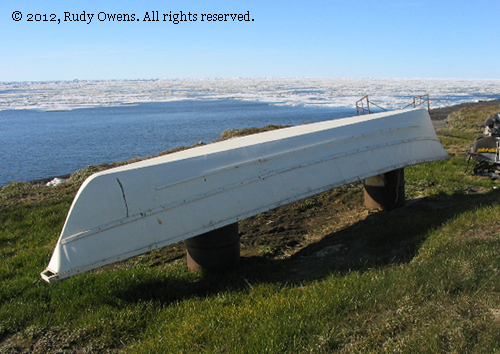 A whaling ship rests in the Arctic summer sun in Barrow, on the coast of the Beaufort Sea. What is clear is that interventions premised on health care will likely be part of a larger strategic framework of nations as powerful as the United States. Those actions, no matter how well-intentioned to improve health care from Kivalina to Kenya, must be understood in a much larger context of any nation’s political and economic interests. This is particularly true regarding access to and the development of natural resources, wherever those resources may be. Before I am cut off from the University of Washington’s online library services as a former tuition-paying student (very expensive), I am researching and downloading articles on public health and health issues that I will no longer be able to access without paying exorbitant fees to companies like Netherlands-based Elsevier. Such companies are making a killing selling peer-reviewed articles at high prices, so only fee-paying institutions can access the research that is funded by public dollars. 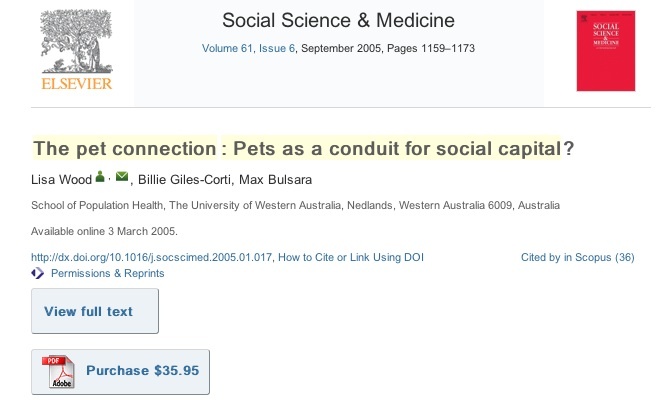 Elsevier sets a not-too-cheap price for the public to “buy” peer-reviewed articles, often funded by public money and taxpayers. According to an April 24 article in The Guardian, more than 10,000 academics are already boycotting Elsevier, to protest its business model that sets high prices for peer-reviewed journal articles and access to them. This protest has been dubbed the “cost of knowledge.” The Guardian reports that many university libraries pay more than half of their journal budgets to the big boys of academic publishing, which also includes Springer and Wiley. One optimistic comment from the editor-in-chief of the prestigious scientific journal Nature notes open access to scientific research articles will “happen in the long run.” Well, I sure hope that happens, but I may not bet on it. In fact there is a display about this debate in the UW Health Sciences Library (my home away from home for the last two years) on the economics and ethics of charging for scientific articles that publish research funded by taxpayers. Right now, only those who pay fees can download many of these journal articles at such university research libraries like this one. And it is through peer-reviewed articles that academics get tenure, validation, and grant funding and that research enters into the realm greater scientific discourse, and eventually the realm of policy-making and responses by the private sector. The Guardian reports that prestigious Harvard University prepared a memo to its 2,100 teaching and research staff calling for action, claiming the institution could no longer afford price hikes imposed by the aforementioned publishers. These fees, in effect, are paid by students like me. In my last week of classes at the University of Washington, I partook in a discussion on this topic and shared my concern with a UW School of Public Health faculty member that public health students are being trained to write and publish scholarly articles, many of which may never be published in open sources outside of subscription services like Elsevier. One suggestion I offered was to help prepare the next generations of graduates to help communicate the science and research findings of their field for open-access sources. The Centers for Disease Control and Prevention already does this in its publications (the Morbidity and Mortality Weekly Report), and does this well, but more needs to be done by future public health practitioners if a sustainable model can be developed to pay for the research to reach the public via open source platforms. My bet is the next generation of public health influencers, like my colleague Valerie Pacino, will be blogging as much as they are writing peer-reviewed articles, and having an impact doing it. 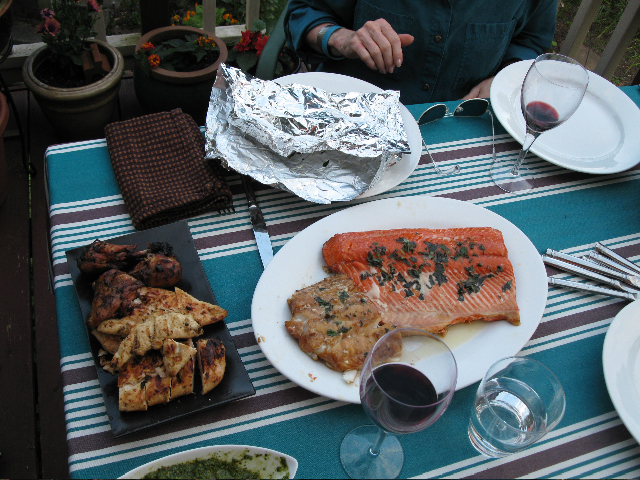 To celebrate the completion of my public health studies at the University of Washington School of Public Health, I celebrated on June 2, the way I always do at the end of long journeys or the start of new chapters—I had a salmon barbecue with good friends. This time I added Alaskan ling cod to the menu. Copper River sockeye and Alaska ling cod — oh yeah, very very good! I love salmon. The fish I bought, Copper River sockeye, was very fresh, and the ling cod was amazingly delicious (have to eat more of this). In the past, I have always marked major milestones of my life with salmon. This includes moving, changing my name, celebrations with friends, and other good reasons to cheer. 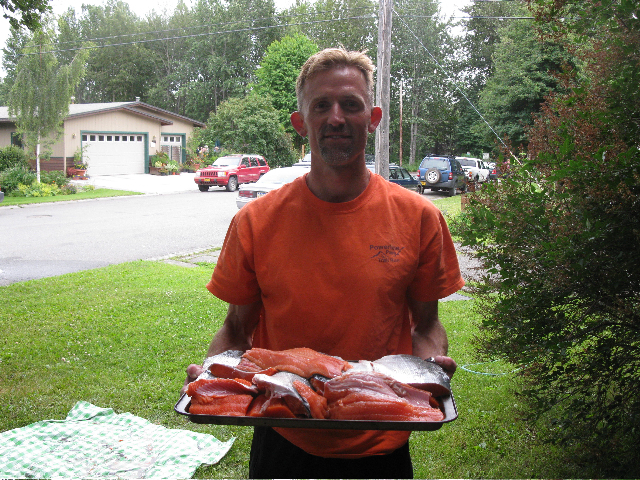 My last night in Alaska, in August 2010, also involved salmon. Times I have left Seattle for journeys abroad have included salmon. In many ways I am following historic traditions of the tribes of coastal British Columbia and their potlatch celebrations. Salmon has long held a special place in the traditions of West Coast Native peoples, from the Salish all the way up to the Alaska among nearly all Native groups in the Great Land (what Alaskans call their home state). Salmon provided food to support both the health and culture of many tribal bands. Dipnet caught Kenai River sockeye, July 2010. Rich in vitamins A and D and omega-3 fatty acids, which reduce the risk of heart disease and stroke, wild salmon is extremely healthy food. Its intake has traditionally been much higher among many Natives because of their subsistence lifestyle. In Alaska, the Yup’ik people, of the Yukon-Kuskokwin region (including the Yukon River), often eat 20 times more fish oil than other people, and they appear to be protected from ill health effects of junk food and obesity with such a diet. However, epidemiologists still assess risk with salmon intake because of potential mercury contamination. In Alaska, epidemiologists recommend people eat fish at least twice a week, and they say wild Alaska salmon of any species can be eaten in unlimited amounts by women and children, but other species should be eaten less, because of mercury and other toxic contaminants that could be found in fish. As a former Alaskan, I was spoiled by an abundance of fresh fish. 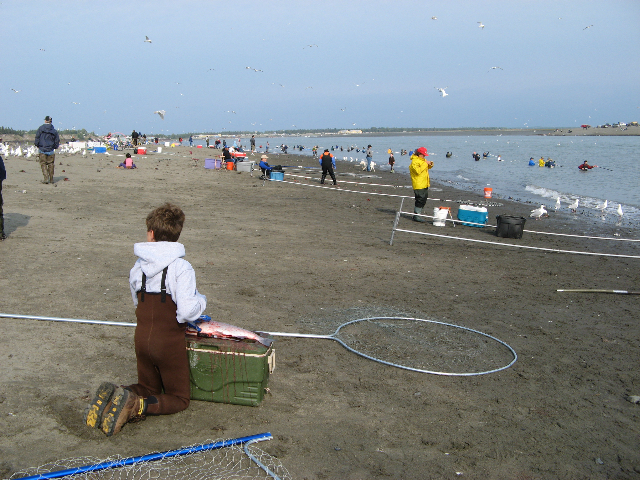 Alaskan residents are still allowed to dipnet and catch fish as subsistence users in the Kenai River and other areas depending on the runs. During my years there, I would dipnet on the Kenai River for sockeye. Dipnetting on the Kenai River, 2008. 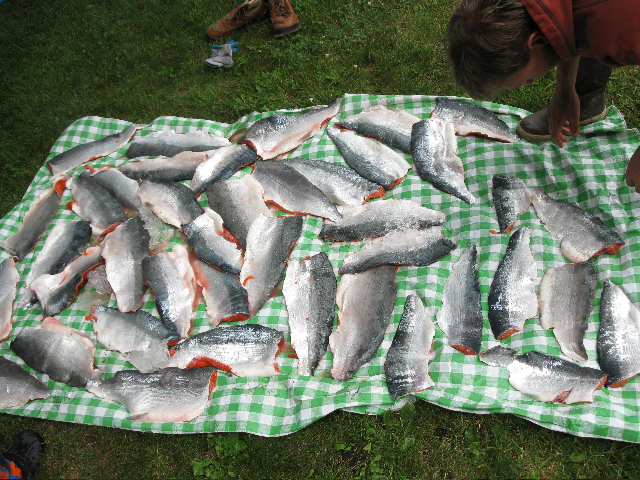 Rudy Owens and fresh caught Kenai River sockeye, 2010. The fish I caught would last me through the spring. Here in Seattle, I spent $18 a pound for Copper River salmon. As a just graduated MPH student, that is beyond my budget. My classmate and I once joked when a nutrition professor asked if students ate fish twice a week. Maybe the professor forgot to check what the tuition price was as the University of Washington. Lentils and rice still keep me going. I forever dream of salmon now.